One of the most desirable aspects of embroidery is its tactile appeal. When you look at an embroidered design, it is almost impossible not to run your fingers across it and appreciate the textural qualities imparted by the thread. To increase this effect we add layers of underlay to emphasize these qualitites. Puffy foam is also used to create a similar appeal. What is often overlooked is the incredibly quick and easy 3-D looks you can achieve with the addition of cording or soutache to your designs. When cording is used to create emphasis or a focal point to a standard embroidered design, the result is spectacular. The low stitch count necessary to tack down the cording barely adds to the overall stitch count of the design, but the look and texture that you add is immeasurable. 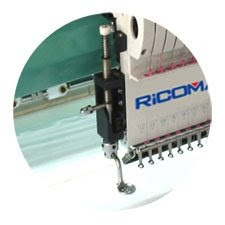 I would suggest that every embroiderer consider this very versatile addition to their embroidery tool arsenal. Cording is not just for fashion anymore.